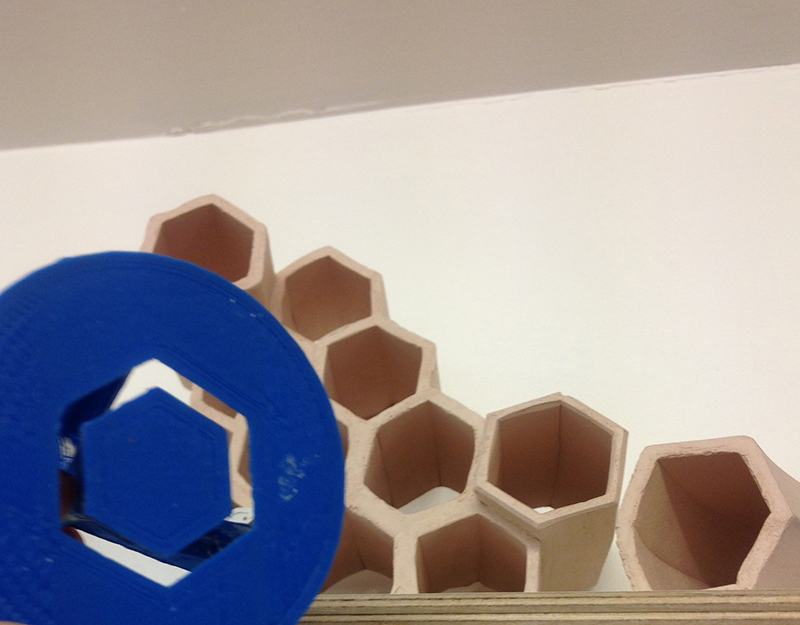 Taslim Martin is a specialist technician of Ceramics and Mould Making for one of Camberwell’s 3D Design Workshops. Tas is also a sculptor, along with making smaller pieces he also has a number of sculptures across the UK. So far, Tas has four other public works in Bracknell, Tottenham, Birmingham, Cambridge and Milton Keyes. 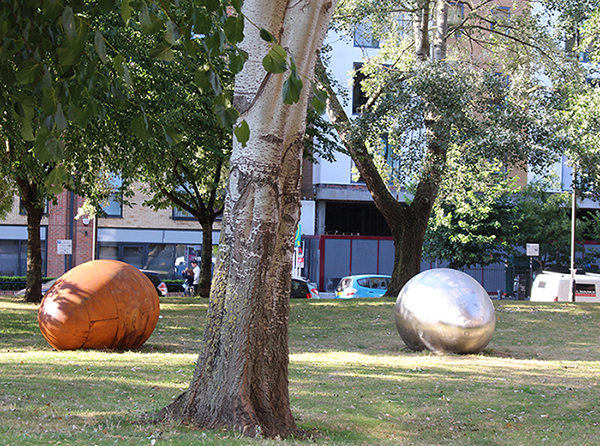 His most recent sculpture ‘Twins’ are two eggs which are a public piece of work in Brixton, installed in August 2016. 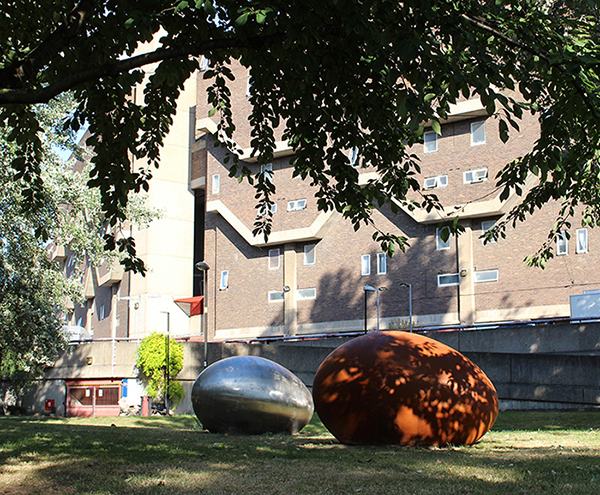 The sculpture was commissioned by Lambeth council and they are a robust public art piece, tucked into a green space between Coldharbour Lane and Southwick House. Man made and rational forms, Tas’ egg sculpture should be a familiar sight to everyone, but made strange by the sheer scale of them. The two large eggs are made up of 38 pieces tessellated together. He cast the metal panels which are 10 mm thick and then bolted and welded them together via tube linings. They are shells; delicate and empty, yet large and impacting, creating compound curves.The process of piecing his jigsaw puzzle eggs together was a lengthy process, one is made of ductile cast iron (the same metal as manhole covers) and the other stainless steel. ‘Twins’ was also a community project – local workshops were set up with children from the community. They were asked to “make their mark” on the eggs. 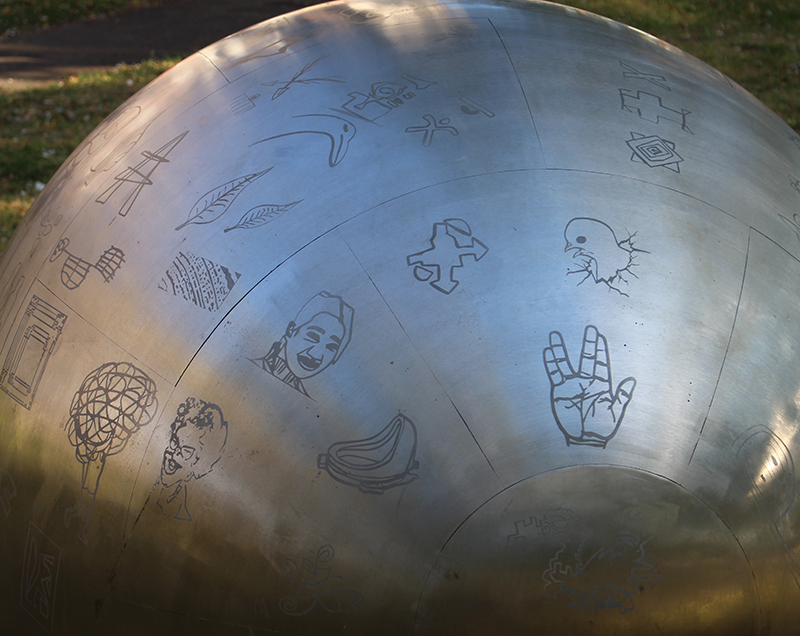 Through these workshops, children in Lambeth council’s community made various drawings which were then etched onto the stainless steel egg. The community are already interacting with the eggs, children trying to find their drawing or showing them to their families. Tas is interested to see how the eggs react to their interaction with nature and the changing seasons. Tas also recently displayed some smaller pieces in Camberwell’s Raum Gallery. The ceramics he made came from an interest in process and materiality. After some research Tas used the Rhino 3D and a 3D printer to create a tool to form his sculptural pieces. 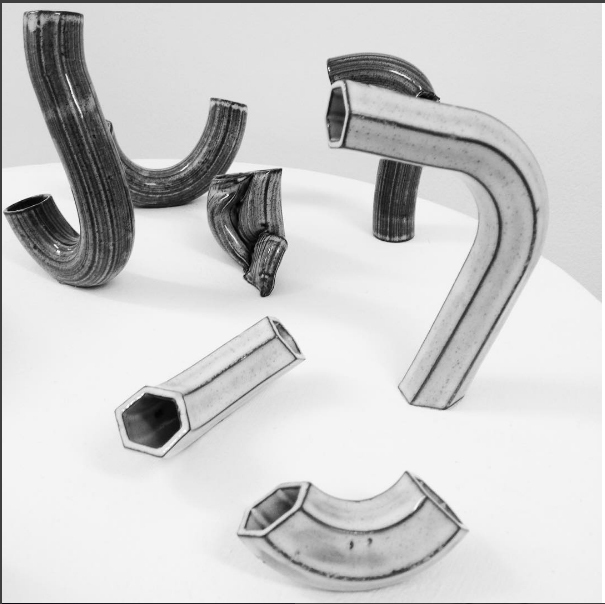 The tool allowed him to form hollow tubes of clay with no crimping. Using digital fabrication technology Tas created simple and tactile sculptures.